Last night, we joined textile artist Rachel Wallis for a community quilting circle for Inheritance: Quilting Across Prison Walls. Inheritance is a collaboration with a group of women in Cook County Jail. Over the course of the summer, they have been writing, drawing and telling stories about the idea of inheritance – what was passed down to them in their families and what they want to pass down to their children and grandchildren. 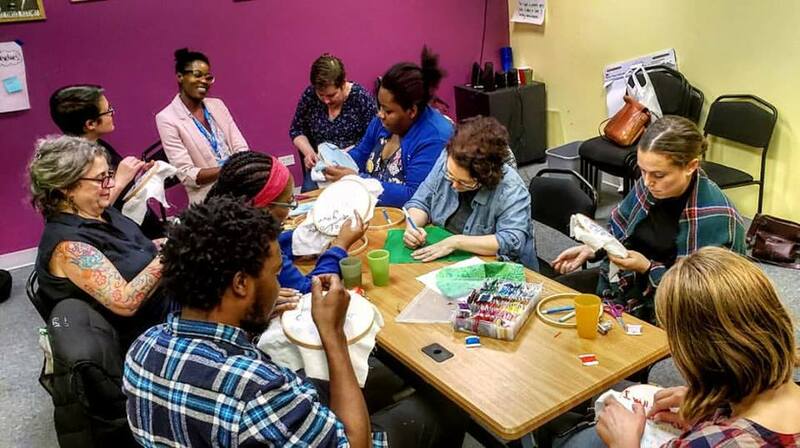 During this three hour quilting circle, we gathered together to sew and embroider their designs and writing, while discussing the impact of incarceration on millions of families across the country.